So the first quarter of 2019 has zoomed past in a blur, and podcasting continues to grow in popularity with listeners, podcasters, advertisers and media pundits. I thought I would share some interesting podcast facts & figures with you. Podcasting is described as an ‘industry’ and large media companies, venture capitalists, and advertising budgets are attracting plenty of attention. Headlines shout, and stories proliferate around the money swishing around podcasting and therefore podcasters. Podcasting is filled with contrasts, and we need to take a reality check. Podcasting is attractive and accessible to all, and has had a rich tradition of independent hobby podcasters. There are also strategic business podcasts which are developed by their hosts for lead generation purposes, and as a platform to showcase their unique expertise. So it’s important to understand that the shouting and hype and millions of dollars are not reflective of small independent podcasts. The danger is that we suffer from ‘comparison-itis‘ and wonder where we are going wrong and why don’t we get millions of downloads and dollars. It is easy to be attracted towards those highly visible gurus who provide podcasting advice. Of course, their advice has worked for them and their fellow guru friends. However, such advice can be inappropriate for smaller podcasts, so please beware. The current attention on podcasting is driving the creation and reporting of more podcast statistics. These stats help us understand the basic trends and drivers of podcast popularity. They help us wonder what we can glean and adapt to our own podcasts. The annual “Infinite Dial” report created every March by Edison Research is a key source of statistics for the podcasting industry. This, like so many others, focuses on data from the USA. Anyway, interesting podcast facts and figures, and infographics on Listening, Audience, & Advertising can provide some good ideas and encouragement for smaller podcasters. And remember that historically, podcast distribution and growth has been ‘powered’ by Apple products. However, worldwide, there are far more users of Android devices, so there is therefore podcast growth potential from Android users globally, as well as from Smart Speaker adoption. One podcast stereotype is that people listen to podcasts primarily whilst driving, commuting, exercising etc. That is true, but around half of podcast listening takes place in the home…. So in a nutshell, listener numbers are growing. Research shows that podcast listeners are affluent, well educated, and typically listen to a large portion of podcast episodes. They are listening more, and listening longer. That is why advertising on podcasts is so popular, and is currently a strong revenue earner for the top podcasts. According to Chartable, in 2018, an average of 757 podcasts were launched every day. That’s about one every 3 minutes! Chartable track over 670,000 podcasts in Apple Podcasts directory and over 210,000 of those published their first episode in 2018. But don’t panic and think there is no point in you starting a podcast – there is also a high level of podfading. Lots of people start a podcast but few keep it going after a few episodes. Anywhere between 50% and 75% of podcasts are no longer in production, and most ‘podfade’ after 7 episodes. In fact I wrote a blog post about how off-putting it can be to think about launching a podcast when there seems to be a high number of podcasts in your niche. In that post, “Too Many Podcasts In Your Category” I encourage you to look deeper into your podcast categories, and I share a case study based on my observations on photography podcasts. 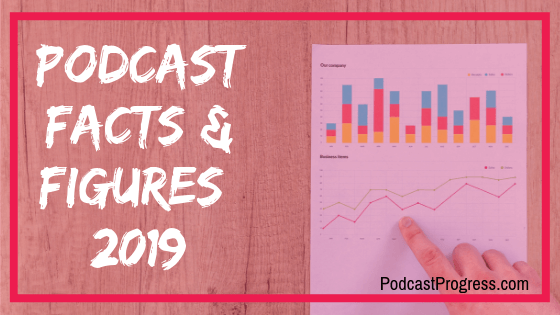 Anyway, there are plenty of detailed blog posts and articles around 2018 & 2019 podcast facts and figures, podcasting statistics and trends, so if you want to dig deeper then I have created a list for you here.